It has been a particularly hectic time this past couple of weeks. Faced with three screenings compared to the usual solitary outing means that a few things were put on the back-burner. Those things are currently being addressed, which means the results of the audience ratings and reactions are late going up, but should be up within the next few days. Along with this post, there will be a wonderfully comprehensive review of the film from one of our audience members Steve Firth. Anybody that attended any of the screenings can by all means join in and send in some feedback on the films. The star-tearing sheets are great for supplying quantitative feedback, but it would be much more appropriate and helpful in some cases to receive some qualitiative feedback. This is particularly relevant for the local independent shorts; it is an invaluable opportunity for the filmmakers to get some direct feedback from real audiences. If you have anything to say about any of the shorts or features screened, please send them over to minicine@live.co.uk. They won’t necessarily be given to the filmmakers in full unless you wish them to be, so you can be perfectly honest in your impressions. I can take this feedback and paraphrase it to whoever created the film. Thank you. Can’t wait to set up more screenings for next year. 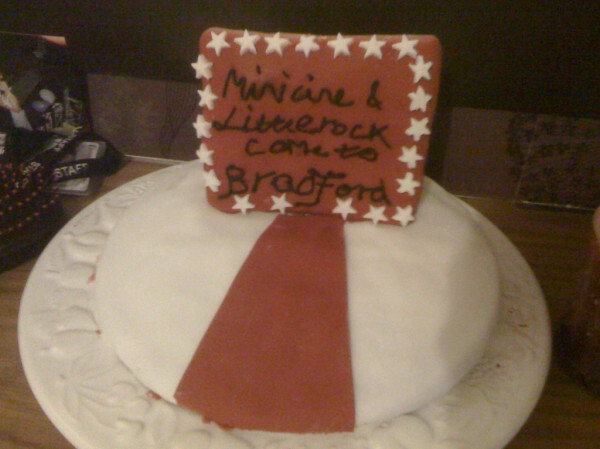 Below is the cake that those who attended the screening at the National Media Museum were lucky enough to experience.